Although few wildflower species were blooming, the late August / early September trip to the Siskiyous still held some floral highlights for me. 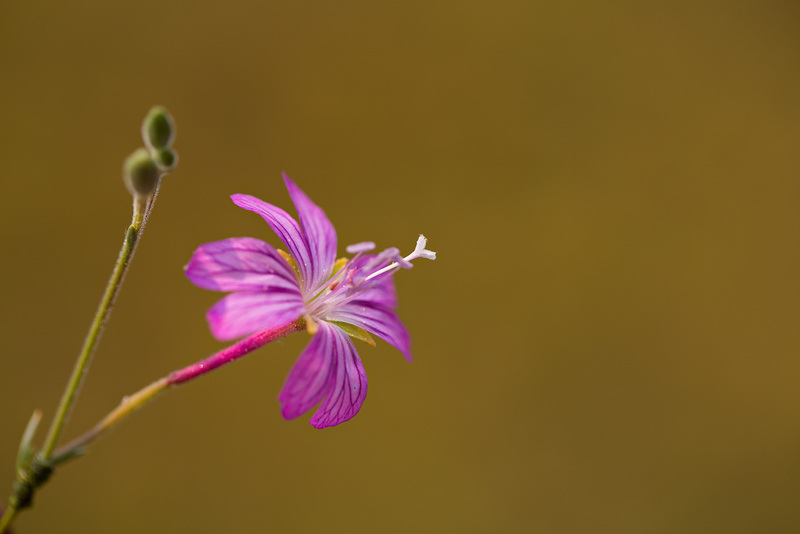 One was encountering and photographing this narrow-range endemic, Epilobium oreganum, or Grants Pass willowherb. Epilobium oreganum only occurs in Darlingtonia californica fens on serpentine soils in northwest California and southwest Oregon. It is one of five co-occurring taxa of concern in these specialized habitats, discussed in the multi-agency report Conservation Agreement for Hastingsia bracteosa, Hastingsia atropurpurea, Gentiana setigera, Epilobium oreganum, and Viola primulifolia subsp. occidentalis and serpentine Darlingtonia wetlands and fens from Southwestern Oregon and Northwestern California (PDF). I think I’ve now seen all of these in flower. Epilobium oreganum is a thin-stemmed species growing up to 1m (3 ft.) tall among the pillars of Darlingtonia‘s tubular leaves. Small flowers, perhaps an inch (~2.5cm) across, eventually develop into slender capsular fruits that are 4.5cm long (~2 in.). Though it shares a similar specific epithet, it is not to be confused with Epilobium oregonense, a much more widely-distributed species. CalPhotos contains a number of images of Epilobium oreganum, including some habitat and whole-plant images. How fantastic! Raised in Oregon, some of my most treasured hiking places were in the Siskiyou and Klamath mountains in southern Oregon. I do not know if I actually saw this plant or not since I was focused on my quest to see and photograph Darlingtonia and Cypripedium californicum growing together. I found them in the Kalmiopsis Wilderness area! They didn’t disappoint me in the least. But, thanks for sharing your photo and information. Makes me want to visit this unique area. You got it. Mahalo Daniel! My mom was born Ft.Klamath and we go every 3 years for family reunion. I have a lot of cousins who live in Chiloquin, OR. Would we be able to find this near Chiloquin? Doesn’t look like it — most populations are southwest of Grants Pass (and the rest are to the northwest), from what I can tell on the Oregon Flora Project Atlas.